I can SAVE $230...But only if I order NOW! 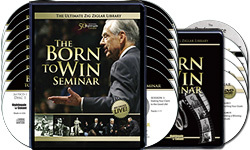 Please send me Zig Ziglar's audio and video program The Born to Win Seminar, featuring 15 CDs, 3 DVDs, a writable PDF workbook, and Writable PDF Performance Planner for just $99.95, which is $230 OFF the regular program price. Take advantage of this limited-time special discount now.